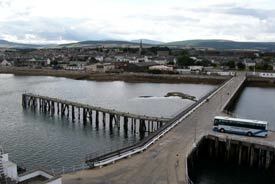 ABOVE: Pier and town of Invergordon, Scotland, the port for Inverness, Loch Ness, and the Scottish Highlands. Invergordon is a deepwater port near the entrance of Cromarty Firth, "the seaway to the Scottish Highlands." Inverness, the capital of the Highlands, is half an hour from Invergordon by road, and Loch Ness--home of the elusive monster--is just a few miles beyond. There isn't much to the cruise terminal--it consists mainly of a pier with room for ships as large as the QE2 and the Norway--but the setting is pleasant, and there's a small shop near the foot of the pier where friendly locals were selling whisky, crafts, jewelry, and Scottish food gifts during our visit. A pipe band (consisting of bagpipers and two drummers) serenaded the Silver Whisper's passengers on board and from the quay as the ship departed.